On 21 July 2017, draft management plans were released for Australian Marine Parks in the Coral Sea Marine Park. 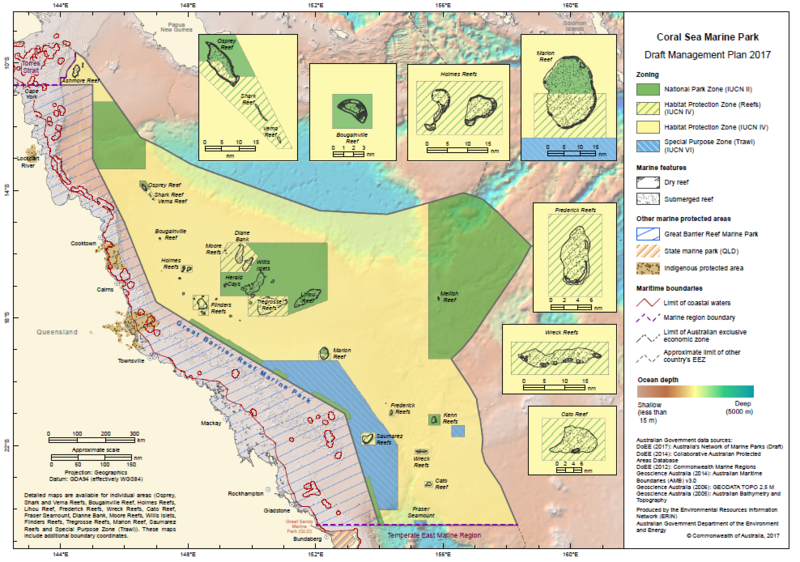 Proposed zoning and rules for the Coral Sea Marine Park, as set out in the draft plan (PDF). Proposed zones in 2017 proposed management plan. The Coral Sea marine region is a remote ocean ecosystem recognised for its unique physical, ecological and heritage values. The environmental significance of the Coral Sea lies in its diverse array of coral reefs, sandy cays, deep sea plains and canyons. The Coral Sea islands and associated reefs support critical nesting sites for the green turtle and a range of seabird species such as noddies, terns, boobies, frigatebirds and tropic birds. The new Coral Sea Commonwealth Marine Reserve will cover 989 842 km2 and is an important national asset in near pristine condition. The reserve will be managed for the primary purpose of conserving the biodiversity found in it, while also allowing for the sustainable use of natural resources in some areas. The reserve includes the different marine ecosystems and habitats of the Coral Sea marine region and will help ensure our marine environment remains healthy and is more resilient to the effects of climate change and other pressures. The new Coral Sea Commonwealth Marine Reserve encompasses the former Coral Sea Conservation Zone, former Coringa-Herald National Nature Reserve and former Lihou Reef National Nature Reserve. Transitional management arrangements apply until a management plan for the Coral Sea Commonwealth Marine Reserve is in place. Transitional management arrangements have been implemented for the Coral Sea Marine parks to cover the period until a statutory management plan comes into effect. There will be no changes in on water activities for any users during this period. Under the Environment Protection and Biodiversity Conservation Act 1999 (EPBC Act), any activity in a marine park requires approval from the Director of National Parks in the period between proclamation of the parks and the implementation of a management plan. This applies to existing commercial activities, including those that involve the taking of native species (fishing). This approval from the Director of National Parks is issued under section 359B of the EPBC Act. Approval can be given to both individuals and to classes of persons, and can be issued with or without conditions on the approved activity.